On the tenth anniversary of the Columbine killings, atheists are fuming about one of our 2006 commercials. Perhaps it’s because we pointed out a connection that’s too close to home. April 20, 2009, is the 10-year anniversary of a most horrific act of school violence. Beginning at 11:19 AM at suburban Columbine High School in Littleton, Colorado, high school seniors Eric Harris and Dylan Klebold killed 12 students and a teacher, and wounded 23 others. It was a massacre that shocked the United States—and the world. Such acts as this—and numerous others since—send a warning that something is happening in our culture—something many are perplexed about. Why would such situations occur? From a biblical perspective and an understanding of a sovereign God, the ultimate answer of course is sin. The Bible makes it clear we live in a fallen world, and because of the effects of sin and the Curse, we now experience violence, suffering, disease, catastrophes, and so on. 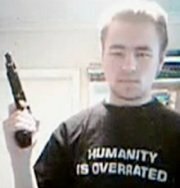 But on the individual level—even understanding we are sinners in a fallen world—we ask what could lead persons like Harris and Klebold to kill their fellow students? I am prepared to fight and die for my cause. . . . I, as a natural selector, will eliminate all who I see unfit, disgraces of human race and failures of natural selection. No, the truth is that I am just an animal, a human, an individual, a dissident . . . . It’s time to put NATURAL SELECTION & SURVIVAL OF THE FITTEST back on tracks! We live in an era of history in which the idea of evolution is taught as fact in much of the education systems of the world. In the USA, it is claimed that by removing teaching about creation, Bible reading, and prayer from the classrooms in public schools, religion has been removed and students are only educated now in a “neutral” environment. However, the science textbooks used in most public schools only explain things in terms of natural processes—the supernatural is not considered. That’s not neutral. Students are being taught the philosophy of naturalism, which is—in essence—the religion of atheism. Also, if one studies the major biology textbooks used in the U.S. and other governments’ schools, one will find that students are taught how the universe and life (including the origin of humans) are explained in terms of natural processes. Students are taught that man is just an animal. One needs to consider what would happen if a student’s entire worldview were built on the foundation of atheistic evolution. If man is just an animal, and there is no God—if we are just “all animals, descendants of a vast lineage of replicators sprung from primordial pond scum,” as stated in a Scientific American article on social Darwinism in 1995—then what one bag of biological chemicals does to another bag of biological chemicals is ethically irrelevant.1 After all, if we are just chemicals arranged in no particular way, then there is no ultimate purpose and meaning in life—except one’s subjective view of things while alive. And it’s not likely that others will have the same subjective opinion. In those days there was no king in Israel; everyone did what was right in his own eyes ( Judges 21:25 ). We live in a culture where increasing numbers of each successive generation have been taught there is no absolute authority. They believe that there is no Creator to whom we are accountable—and everyone has a right to do what is right in his own eyes. To challenge people concerning this matter—and, in a sense, to shock people into the reality of what is happening today—in 2006 Answers in Genesis contracted with a marketing agency to produce a video clip dealing with violence as part of a branding campaign for the AiG ministry. (We also had two other video clips produced: one based on the 9/11 tragedy and one dealing with prejudice and racism). About two weeks before I was due to review concepts for this campaign, the Creative Director was attacked in her driveway as she returned home from a short run in the park. Seeing the man’s face who intended to do her harm just inches away from her own suddenly helped her understand with extreme clarity that violence isn’t just something that happens to someone else—it’s personal. It’s in your face; it violates your personal space in every way—it’s frightening, and it’s something you never forget. Once we all understood the importance of being real with our message and deciding not to shy away from its uncomfortable “in your face” proximity, we committed to making each second of our TV spot count even more than ever before. Every detail of this spot took on a renewed importance, and we determined to not candy-coat our message. First, the boy was cast based on recent news events at the time which showed clean-cut, white, American kids killing their classmates and friends in schools and neighborhoods all across the country. It wasn’t just inner-city ethnic kids who were causing trouble all around us—it was white, rich, privileged children. The location of the farm was chosen with care as well. It was done on purpose to remind us all that violence can happen anywhere—it’s not just the inner cities and the ghettos that are making the front page. It was white, upper-class neighborhoods and safe suburbia kids who were making the news. We watched TV and read the paper—there is no way we could have ever scripted something so horrific as Columbine. All we did was pay attention to what was happening all around us and let it inspire the truth in every detail of our campaign. Our message was straight from the heart of our organization. If we are truly just evolved from ape-like ancestors, then why should we fight for the sanctity of life and protect and cherish it at all costs? Why is it important for us to exercise self-control when we are angry or frustrated? Why should we deal with problems with love and understanding instead of violence if there is no sanctity of life? If God really doesn’t matter and perhaps does not even exist—if Darwin was right all along and we just randomly evolved from ape-like creatures, if we aren’t fearfully and wonderfully made in the image of a divine and loving God, then go ahead—let survival of the fittest rule supreme. If the Ten Commandments are ripped off the walls of our schools and courtrooms and disregarded as a basic ethical God-given code of conduct, then who should care if kids are killing kids and men are attacking defenseless women in their driveways at home at night? We watch animals hunt and tear each other apart every night on the Discovery channel. If you don’t matter to God, then tell me—do you truly matter to anyone? If God doesn’t care about what happens to you, is anyone else obligated to care? Even the production value of this spot was meticulously planned and chosen to be the best that it could be. No detail was ignored and we hired a top director and crew—a crew who flew in from shooting international spots for secular multi-million dollar campaigns because they believed in what this campaign was communicating and weren’t afraid to embrace its brutal honesty along with us. And because they believed in what the campaign was designed to communicate, they did so for only a portion of what they normally earn. The beauty and wonder of this spot is the truth behind it and the motivation for its conception. You do matter to God, and, therefore, your life and your existence on this planet that we all share ought to matter to everyone. If someone does you harm or violates your human rights, we, as your neighbors and community and church and government, need to be quick to come to your defense and aid and fight for justice and dignity at all cost. You are created in the image of an amazing loving God and you matter. There is such hope in that promise. This spot is not sensationalism if you have lived and experienced and been touched by violence and understand what it feels like to be violated in such a personal way—when you have looked down the barrel of a gun and felt hopelessness and fear beyond your wildest imagination. It’s plain and simply—and sadly—reality. A reality that can be filled with light and with hope when there is an understanding that God loves each and every individual and that every single solitary life matters to Him. Earlier this year (2009) we had the video clip about violence put up on YouTube.com to reach others. A number of atheists have attacked this clip very aggressively with outlandish claims and outright falsehoods in an attempt to deflect people’s attention away from the vital message of this clip. 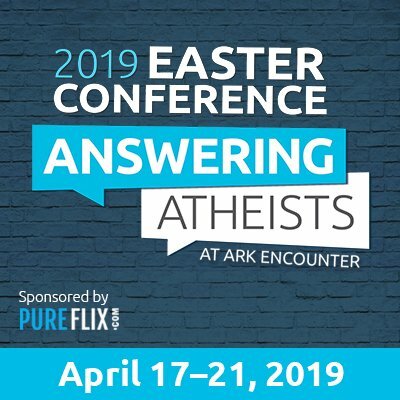 Answers in Genesis has decided to become a hate-site and promote the killing of atheists. This is a television spot that the organization has put out. . . . The text that goes with the advertisement says: “If you don’t matter to God, you don’t matter to anyone.” So, another thing that this advertisement is selling is the idea that atheists do not matter to God and, as such, they should not matter to the kid with the gun. It grants a moral permission to kids with guns to go ahead and kill atheists.
. . . More broadly, the advertisement also represents an attempt to rule by terror. AIG’s “Believe in God or die campaign” is a message to anybody who might put on a T-shirt with the letter A or otherwise identify themselves as an atheist, that you are making yourself a target. Any logically thinking person can see that such claims are beyond ridiculous. However, this is the kind of hate speech against Answers in Genesis that such atheists are spreading around the Internet. It is a scare tactic in an attempt to denigrate AiG’s integrity and falsely represent what Christians believe. The boy depicted in the video clip represents how so many more young people are prone to violence nowadays (which has been on the rise since Columbine ten years ago). In this video clip—and its limited text—people are directed to seek out our website for an answer to the general question: “Why is there so much violence and death in this world—and does God have anything to do with it?” In fact, when this campaign appeared in 2006, it was linked to a page on our website discussing the lack of purpose and direction that atheistic naturalism gives to generations of young people. While the bankrupt theory of evolution does not directly lead to horrible violence by young people, we would suggest that if they were told that there is a Creator, who gives a purpose and a meaning for His Creation, then this cannot help but provide young people with some meaning to their lives. (Of course, given the judicial climate at present, presenting that message in a public school is virtually impossible.) It’s not surprising that teen suicide, for example, has grown proportionately to the increased teaching of evolution. “Life lacks purpose” is the message they hear. We want to provide to as many people as possible—through such video clips and other marketing pieces—a biblical answer to that puzzling question of why there is so much violence in the world. AnswersinGenesis.org directs people to such answers and also shares a life-impacting gospel message. We believe this campaign can be an effective outreach and is powerfully relevant to the society today. It will engage the culture with answers to questions that many are asking in the wake of school violence and other recent violent tragedies. In the book of Genesis we read that God created a perfect world—that is, a world that did not know death, suffering or any kind of evil. In this perfect world lived two people who took it upon themselves to try to become like God. In doing so, their sin led to the Fall from grace this world and everyone on it has experienced ever since. Our world is not perfect—in fact, it’s very broken. If God withdrew His sustaining power completely from the world, it would cease to exist. God is paying attention and is actively involved in His creation, but He doesn’t always protect mankind from its own actions. Even the earth itself was cursed after the first sin. God is paying attention—so much so that He sent His Son, Jesus Christ, to pay the penalty for mankind’s sin and offer forgiveness to all. God has promised everything will be made right again. He will wipe away every tear and death, pain, and suffering will be no more. This is the perspective we wish to share, and a striking video clip is one way to get people’s attention, inspire them to visit our website, and get answers. Incidentally, this video clip received a number of awards in the secular world including advertising industry awards for Best of Show, a Gold ADDY, and the Mosaic Award for ethnic diversity and honesty in advertising. In the sidebar, we have included some of the fascinating details as to how this clip came to be produced. Even this background information can be eye opening for you. AiG is not saying that evolution is the cause of violence. Sin is the cause. However, the more generations are taught they are just animals and that there is no Creator God, the more people will act consistently in accord with who (or what) they believe they are. AiG is not saying that every atheist/evolutionist will commit violent acts. The Bible makes it clear in Romans 1–2 that man has a God-consciousness and a conscience knowing right and wrong. People inherently know it is wrong to murder and commit violent acts against others. Actually, atheists have to borrow Christian presuppositions when they say that murder and violent acts are wrong! Atheists have to live inconsistently. The problem comes about when people act more consistently with their atheistic presuppositions! Have you ever thought about the fact that the supreme act of violence was carried out (against Jesus) because of sin and the resulting wickedness of men, but God used that to pour His love out on us? Jesus paid the penalty for our sin and offers us the free gift of salvation! For God so loved the world that He gave his only begotten Son, that whoever believes in Him should not perish but have everlasting life ( John 3:16 ). John Horgan, “The New Social Darwinists,” Scientific American, October 1995, pp. 175–176.